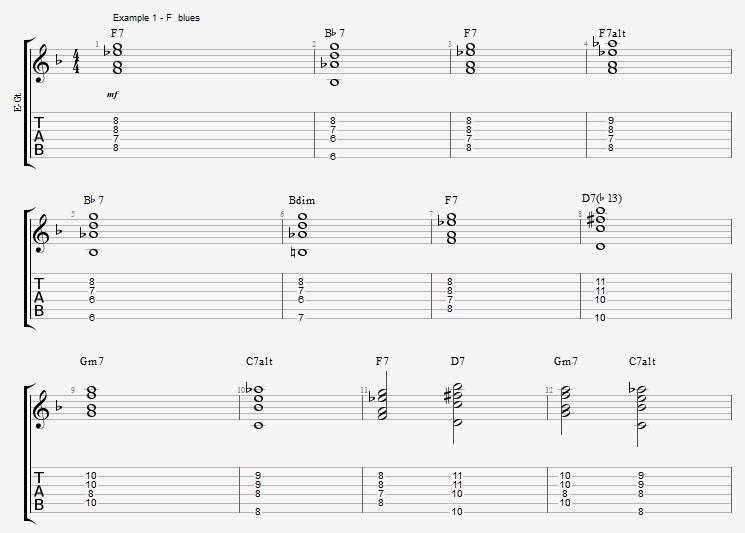 Playing the chords on a jazz blues is a great way to start your journey into jazz guitar. In this video I will go over a 3 step process where you learn some basic Jazz Blues Comping and turn them into tools that you can use to comp more freely and develop your own chord vocabulary! All the examples are on an F jazz blues. One of the things I love about comping is that it is fun to play small melodies with jazz chords behind a soloist. Being able to play these comping melodies can be tricky. But it doesn’t have to be that dificult. In this lesson I am going to go over a three step process that will help you find the voicings and develop a varied and interesting comp on a Jazz Blues in F.
The idea is to take the Blues in F. Go over some basic chord voicings for it. Take these voicings and then go over how you can use the chords to make more voicings that are easier to play melodies with. Talk about a few ways to make comping melodies with the voicings. 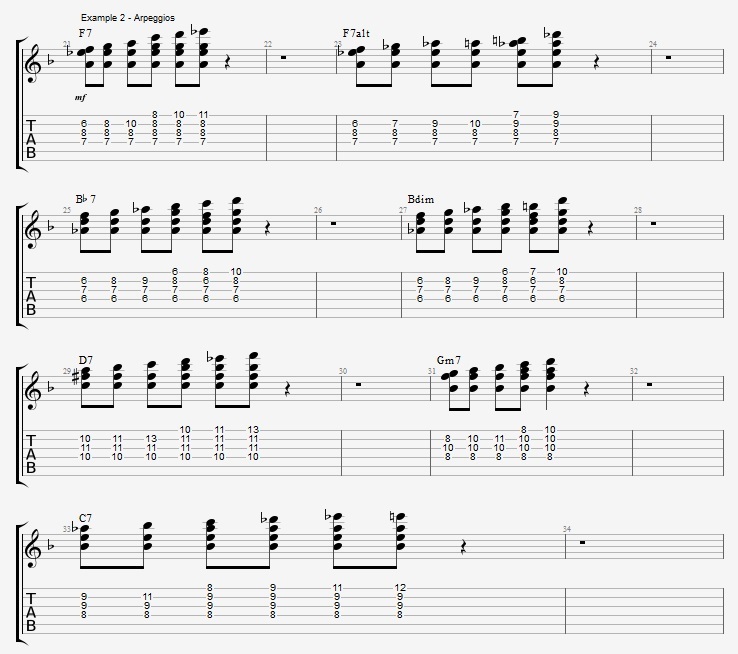 Finallly I will go over how I might play a chorus with these more complex voicings. If we take voicings that I used in example one and then don’t play the root as a bass note we get a smaller more flexible voicing. With this voicing we can start to use different top notes which gives us the option of playing melodies with the chord under it. For these chord voicings I have often left out melody notes that don’t sound good on the chord. In most cases these are the 4th against the root, so for example the Bb over an F7 chord. This is just to keep it simple. I have other videos on comping that deal with this in more detail. As you will see in the next step we can in fact do a lot by ignoring this for now. 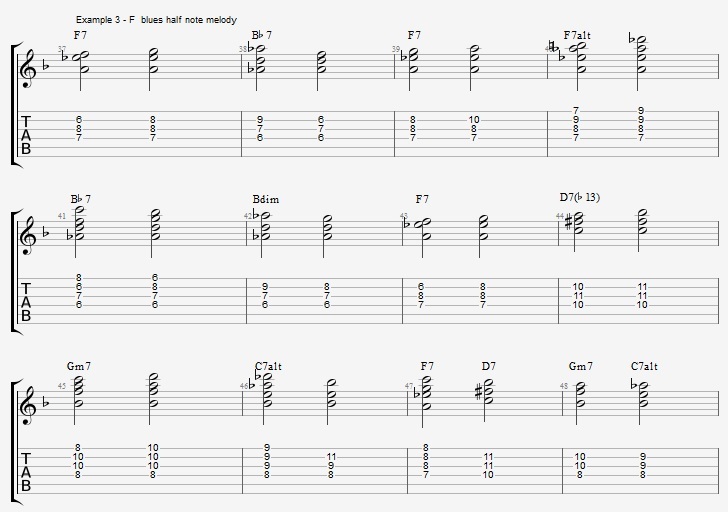 Now that we have the vocabulary to play small melodies with the chords you probably want to check out that first, so try to sit down and play some small melodic ideas for each chord just to get it into your fingers and to start building some ideas for comping in this way. In general I am using a step wise melody because we want the comp to have a natural feel with a lot of rest. Since the melody is really strong I don’t really have to be concerned with voice-leading when playing and can just focus on the melody, which is also a lot easier to hear and relate to musically. Taking the melodies a step further! If you begin to be able to make your own slower comping melodies you probably want to start to develop some more varied stronger ideas. One of the ways you can do this is by using motifs. When you use a motif in this way you will in most cases be generating what is most often referred to as a riff. An example of a simple riff used through a 12 bar blues is shown below in example 4. The main motif that I am using is fist stated in bar 1 and then gradually varied and moved through the changes. You will notice that I am not always sticking to rigorously staying with the motif and that is of course a judgement call. I hope you can use the examples and the ideas I went over in this lesson to develop your own comping. We spend more time playing comp than soloing, but this aspect of playing behind other musicians is a lot of fun. 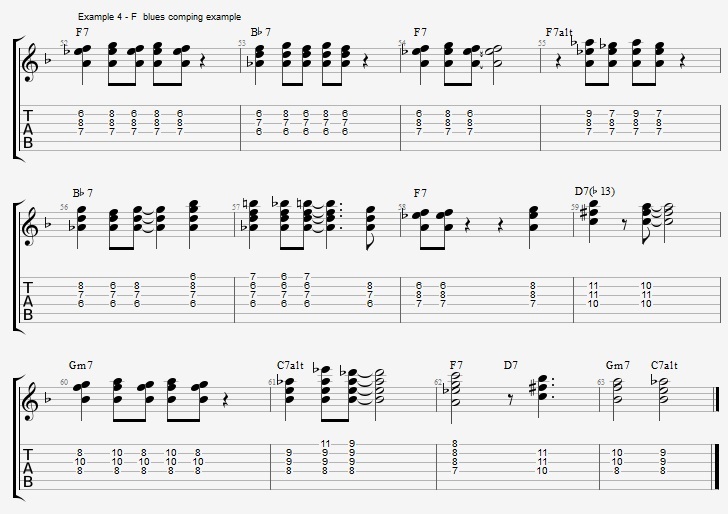 This entry was posted in Blog, Lesson and tagged Blues comping, chords on a jazz blues, Comping an F Blues, jazz blues chords, Jazz Blues comping on April 20, 2017 by jens.